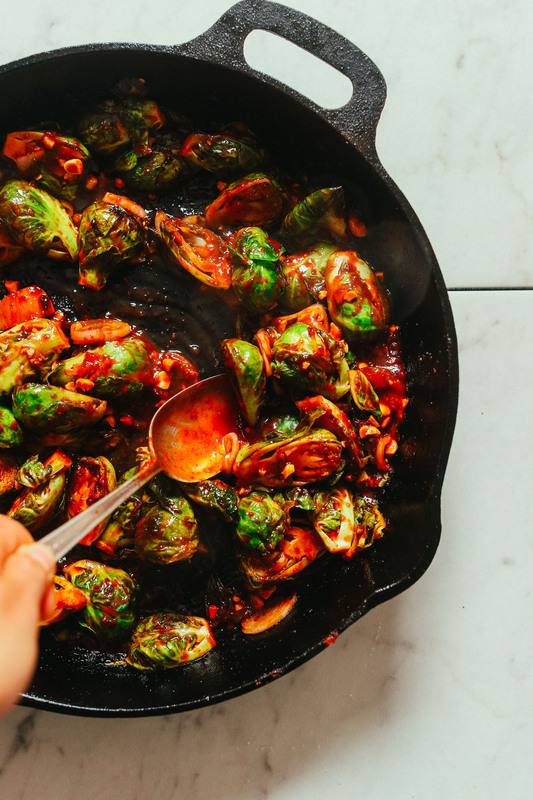 We tried a new-to-us restaurant recently in Portland and it was so tasty that I knew right away I had to try to recreate their Gochujang Brussels sprouts at home! Lucky for you, I’ve taken all the guess work out of this delicious side dish or appetizer. Plus, just 7 ingredients and 30 minutes required! 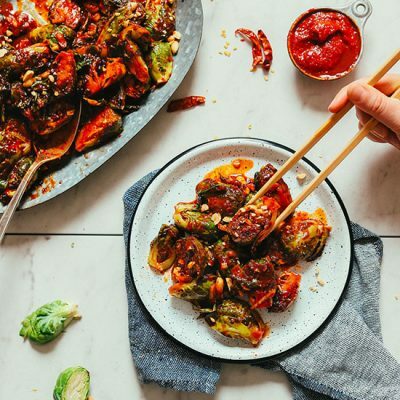 If you’re into Brussels sprouts, you’ll love this dish because they’re stir-fried to golden brown (but still tender) perfection and coated in the most savory, bangin’ sauce on the block: Korean Gochujang Chili Sauce! Have you tried it yet? Most store-bought brands contain gluten and processed ingredients, so I set out to make my own. I’m so glad I did because I’ve been putting it on everything since, like Cauliflower Wings, my saucy Crispy Tofu, and now Brussels sprouts! It all starts with the sauce, which comes together in 5 minutes. Then just heat a skillet over medium-high heat, add a little sesame oil, and start stir-frying these gems. The sauce coats the Brussels near the end of cooking and adds a nice caramelized effect. Swoon! This would make the perfect side or appetizer to things like our Eggplant Almond Butter Tofu Bowls, Spicy Gochujang Cauliflower Wings, Quinoa Fried Rice, Cauliflower Rice Stir-Fry, and our 30-Minute Noodle-Free Pad Thai. If you’re into Brussels sprouts, also check out our Brussels Sprout Slaw with Coconut Bacon, Garlic and White Wine Pasta with Brussels Sprouts, and Crispy Garlic Brussels Sprouts with Sriracha Aioli. If you try this recipe, let us know! Leave a comment, rate it, and don’t forget to tag a photo #minimalistbaker on Instagram! Cheers, friends. 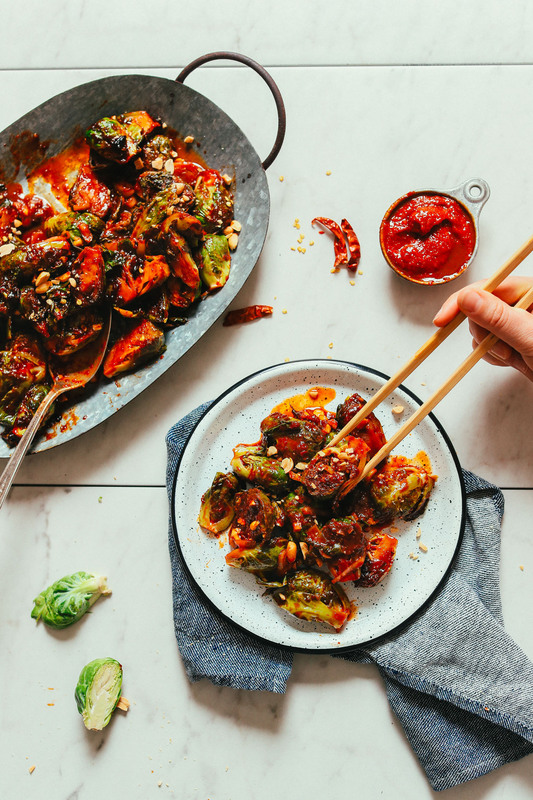 Spicy, saucy Brussels sprouts stir-fried in homemade Korean Gochujang chili sauce! The perfect appetizer or side for Korean- and Asian-inspired dishes! Just 7 ingredients required! 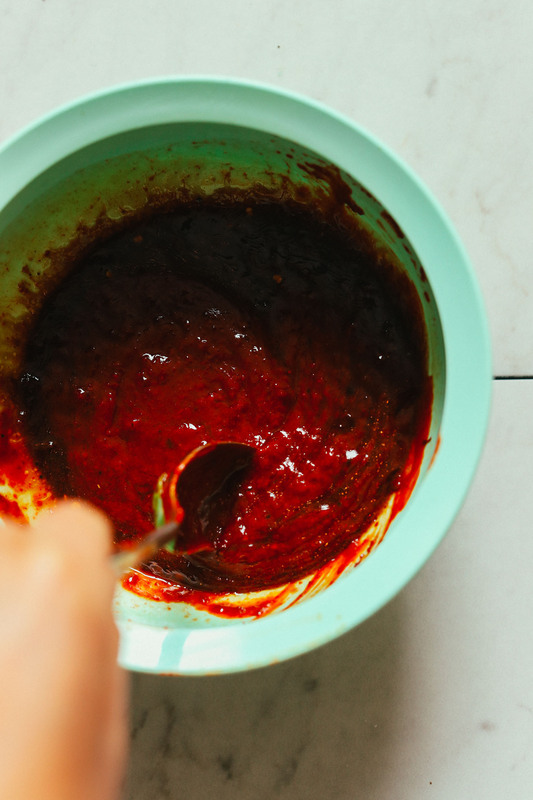 Prepare sauce by adding Gochujang sauce, sesame oil (or water), coconut aminos, maple syrup, sea salt, and chili garlic sauce to a small mixing bowl and mix to combine. Taste and adjust flavor as needed, adding more chili garlic sauce for heat, maple syrup for sweetness, or coconut aminos for depth of flavor / saltiness. Set aside. Make sure your Brussels sprouts are rinsed, dried, and halved and any large stem portions are removed. Heat a large cast-iron or metal skillet over medium-high heat. Depending on the size of your skillet (ours was a 12-inch cast iron), you may need to cook the Brussels in two batches so they get evenly cooked and don’t crowd the pan. 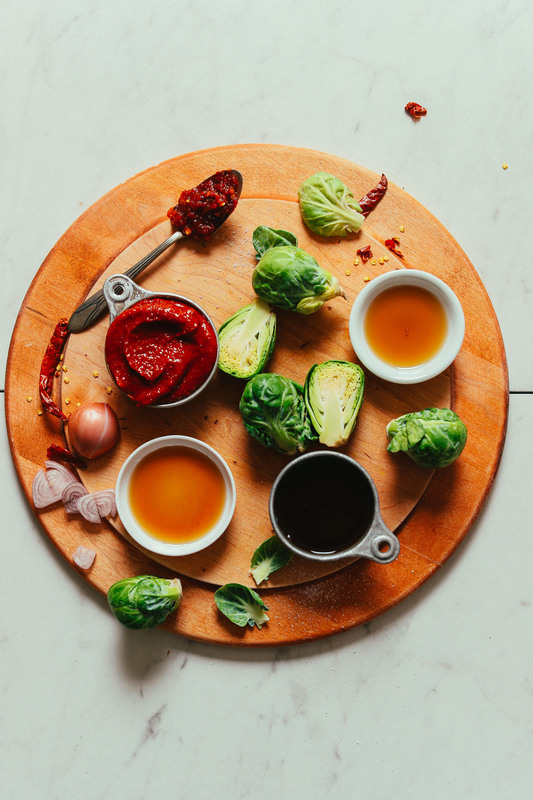 Once hot, add sesame or avocado oil (or water) to the pan and Brussels sprouts (know that oil is better for frying and caramelizing the sprouts). Season with the coconut aminos and toss to combine. Then evenly spread the Brussels sprouts in the pan so each one is touching the surface of the pan (remove any that are crowded). Cover and cook for 2 minutes. Then remove lid and stir-fry uncovered for 2 minutes more, stirring occasionally to brown all sides. Turn down heat if needed if any are appearing too brown. Once the Brussels sprouts appear to be caramelized, add the sliced shallot or green onion (optional) and the prepared sauce and stir-fry for 1-2 minutes more to coat and caramelize the sprouts even more. Then turn off heat and transfer to a serving platter. Garnish with crushed peanuts if desired (optional). Enjoy hot. Store cooled leftovers in the refrigerator up to 3-4 days. Reheat over medium heat in a cast-iron skillet until hot. Not especially freezer friendly. These are delicious on their own but would also pair well with our Gochujang Cauliflower, Easy Vegan Kimchi, Quinoa Fried Rice, Sesame Eggplant and Almond Butter Tofu Bowls. *Nutrition information is a rough estimate calculated with sesame oil and without optional ingredients. *If you'd rather roast your Brussels Sprouts, simply toss in the marinade then roast on a baking sheet at 400 degrees F (204C) for 15-23 minutes, tossing near the halfway point to ensure even baking. You'll know they're done when the exterior has a deep brown color but the interior still has a little bite. I like this so much and make this so often that I have all the measurements for 2 servings memorized! Thank you for always coming out with new and scrumptious recipes! If I don’t have coconut aminos biybindo have soy sauce, is it a 1:1 ratio? Hi Julie, we recommend starting with less soy sauce than coconut aminos and working your way up if it needs more saltiness. Hope that helps! I loved this recipe. It’s easily my new favorite way to prepare Brussels! Really gorgeous! I substituted honey for maple syrup as I can’t find it here in Spain very easily. I sprinkled sesame seeds on it at the end as well as some freshly grated ginger. Yum! Thank so much for your beautiful recipes and photography. All the best. The wife and I made this and it turned out really well. Thank you for posting the recipe. delicious recipe! My family and I loved it! I’ve always had brussels sprouts with balsamic and thyme, and this was such a cool new way to eat them! Thank you! Made it, loved it. I’ve never been a fan of brussel sprouts but they were irresistible in this recipe. Thanks for another great recipe. Great! We are so glad to hear that, Paul! I hate to be this person, but I found this under soy-free and gochujang is made from fermented soybeans. Looks fabulous! Can’t wait to try it. Hi Danielle! I think that should work, though we haven’t used monk fruit syrup and can’t say for sure. If you experiment with it, report back on how it goes! OMG, this was fantastic!! I used root vegetables with tofu and I sprinkled a handful of sunflower kernels on top for that little extra crunch. (I also subbed the chili paste with my Trader Joe’s Harissa paste) My miso was organic soy. Thank you! We had a jumbo sized bag of sprouts from Costco, so I made this twice this week! I didn’t make any changes to the recipe, though I doubled the sauce and stir-fried some tofu in it. Incredibly easy and so delicious! The reduced/carmelized saucey bits are a real treat! Thanks for another keeper! Hi there – could I sub harissa for the Gochujang sauce, or would that be too variant a flavor? This is SO GOOD that it became a classic in my kitchen ! This sauce works well with nearly anything (tofu, any greens, …). Thanks a lot for this one ! We made this recipe for dinner a few nights ago and absolutely loved it. We served the sprouts on top of brown rice and since we aren’t vegan, we added an over easy fried egg to the top (the yolk made everything a bit more creamy and saucy). We garnished with a generous portion of sliced green onions. With or without the egg, it’s a hearty satisfying meal. Thanks for another winning recipe!!! Thank you so much for getting back to me. Being a 5yr old, I couldn’t wait!! Lol. I defrosted the brussel sprouts and dried them. Clearly, fresh ones would have been better, but it was still delicious. I then got creative. I’m sure this makes no sense, but since i only needed half the sauce (I didnt have a lot of sprouts,) I added the juice and some zest of an orange to the remaining sauce. Yum. I’m using it on tofu. Thank you again for another great recipe. I was in a bit of a ‘vegan rut’. Thanks for sharing how it went, Donna! We are glad to hear that you enjoyed them! This recipe looks great. I have frozen brussel sprouts on hand. I’ve never cooked fresh ones. Do you think I can defrost and then use them? Also, how do you think this would go with brocolli? Warning! Make sure you use coconut aminos not liquid aminos I made this mistake and it was so salty I could barely eat…can’t wait to try it again. If I were to use just regular soy sauce do you have a recommended amount? Delicious. My husband loved the spice, though for me, I should have followed the advice to taste-test as I made it. Just a little hot for me. :) I couldn’t find the miso at the store to make my own, but I did find the Go-Chu-Jang sauce (small-print ingredient list; not gluten-free, but as far as I could tell it was vegetarian). This dish was delicious and easy to make. My husband loved it! No Bones was a STELLAR recommendation for our trip to Portland – my husband is a veg and isn’t used to having so many tough decisions to make on a menu! The sprouts were phenomenal, and I can’t wait to try to make them at home. Super simple and excellent!! I roasted my brussel sprouts instead of frying them to ensure they cook all the way, then followed the rest of the recipe. Peanuts are a must, they add crunch and I am in love with them all..
Smart! Thanks for the tips! Super tasty side dish! I put these brussels over some rice noodles with other toppings, and it made a flavorful and quick meal. I’ve never cooked anything like this, but I am happy I gave it a shot! This is one of my favorite things I’ve ever made, made some tofu done in maple syrup and pepper and red rice to go with the sprouts, and topped with black sesame seeds. Delicious! I made this for dinner last night and it’s delicious! The Gochujang is now a staple condiment in my house. I did have to sauté the sprouts a bit longer than the recipe suggests in order for them to cook through- but I had pretty giant sprouts to begin with. I ate it with plain jasmine rice on the side and it was a totally satisfying meal. As a side note, I would LOVE to see a recreation of No Bones’ crab sando. It’s my go to dinner every time I stop in. Yay! Thanks for sharing!! I’ll add the sandwich to my list! Hello. Still waiting to get clarification on the sesame oil (posted on the 20th). Toasted or regular? Thanks. I used regular sesame oil, and it was perfect, I don’t think toasted was meant here. Thanks, Steff! Both can work. 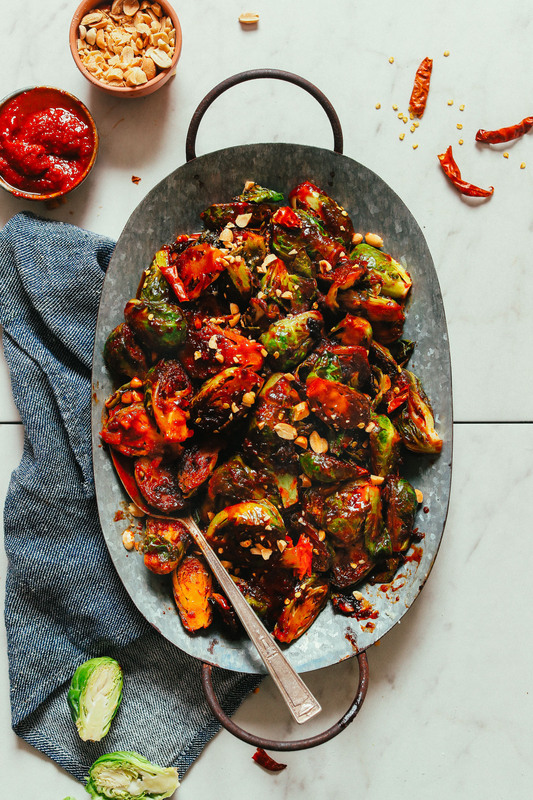 I usually do balsamic and chili flakes for my b-sprouts….this is looking like it will be my new go to! Awesome! We hope you love it, Megan! Absolutely love Gochujang with fresh vegetables! 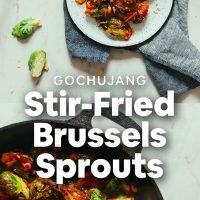 I have never tried Gochujang-style Brussels sprouts in my entire life. That being said, I must must MUST create this recipe for the perfect first time! I bet that this would be perfect in a Buddha bowl or with some rice and grilled tofu. Hey, you gotta zest up your vegetables in some way! we LURVE our brussel sprouts and usually roast them to perfectionne :-} I make Kimchi so I always have Gochugaru in house. Saw your link to making the Gochujang sauce but wondered if there’s some way to NOT have to use so much sugar (I know it’s maple syrup, one of the ‘healthier’ sugars but STILL, it is sugar). Just curious… Thanks! Sure! Just leave it out while making the sauce! Hmm, it’s not an issue for me. But you can certainly use alternatives, like red chili paste or flake. You can use any oil you’d like. I prefer toasted sesame! This brussels sprouts look TO DIE FOR. I love anything spicy!! There’s a Korean restaurant I love to go to that serves this sesame rice dish with the same sauce which I just loveeee! It must be so amazing on these brussels sprouts too! Is the main Korean sauce similar to any other Asian sauces? Ive never seen this one in my local grocery stores… Do you have a recipe for that ingredient? Thanks! This looks excellent, but also kind of scary to me as I tried kimcheeing sprouts once, and it did *not* go well!